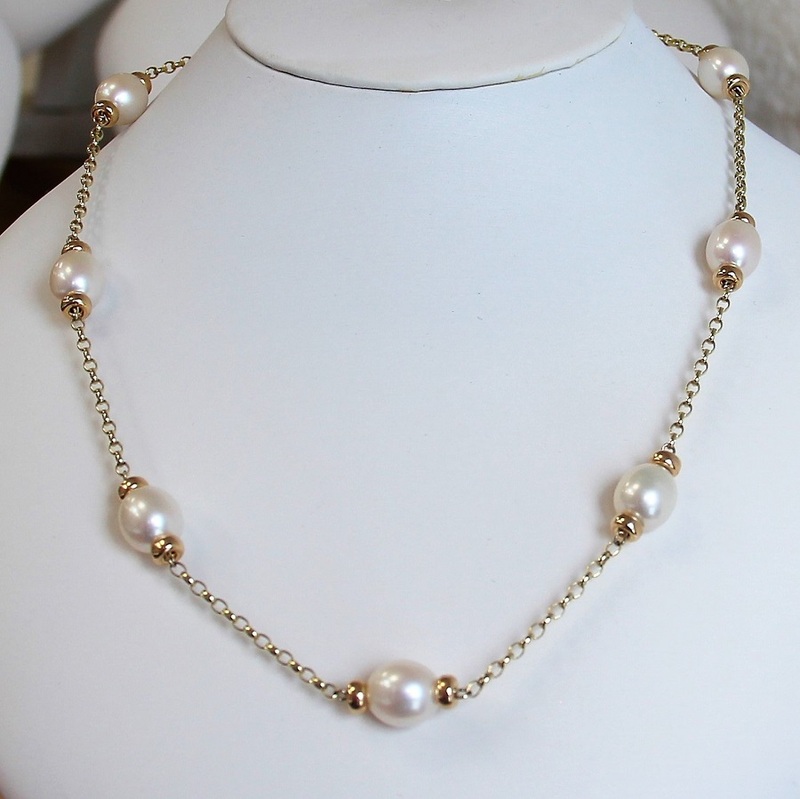 ‘Mary Berry pearl necklace’ inspired by Mary Berry wearing lovely pearls on her cookery shows. Large rice shaped pearl necklace made by hand and to order in our workshop. 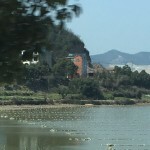 We source our pearls personally on an annual trip to China and Hong Kong where many of the world’s loveliest pearls are grown. 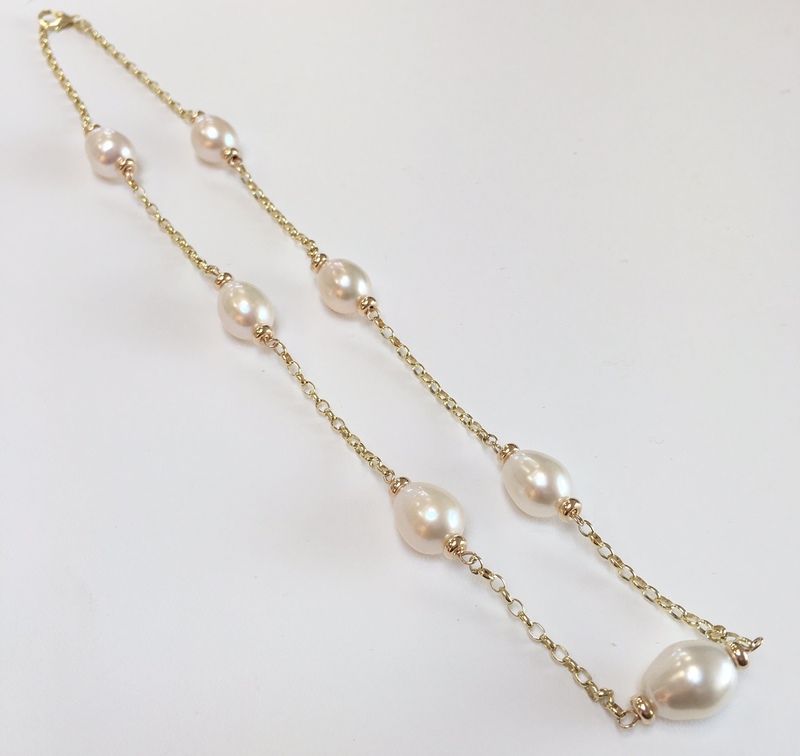 The cultured freshwater pearls in this necklace are stationed on 9ct gold Belcher chain with 9ct gold rondells and fastened with 9ct gold lobster clasp. 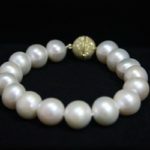 We would normally make this pearl necklace to a standard 18” length but we also make the necklace to 16”, 20” and 22”. 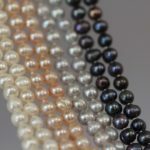 We are also able to offer this necklace using round, irregular or coin cultured freshwater pearls, please contact us for further details and a quote. We have other necklaces in our Mary Berry Collection plus we can make the necklace to your design. 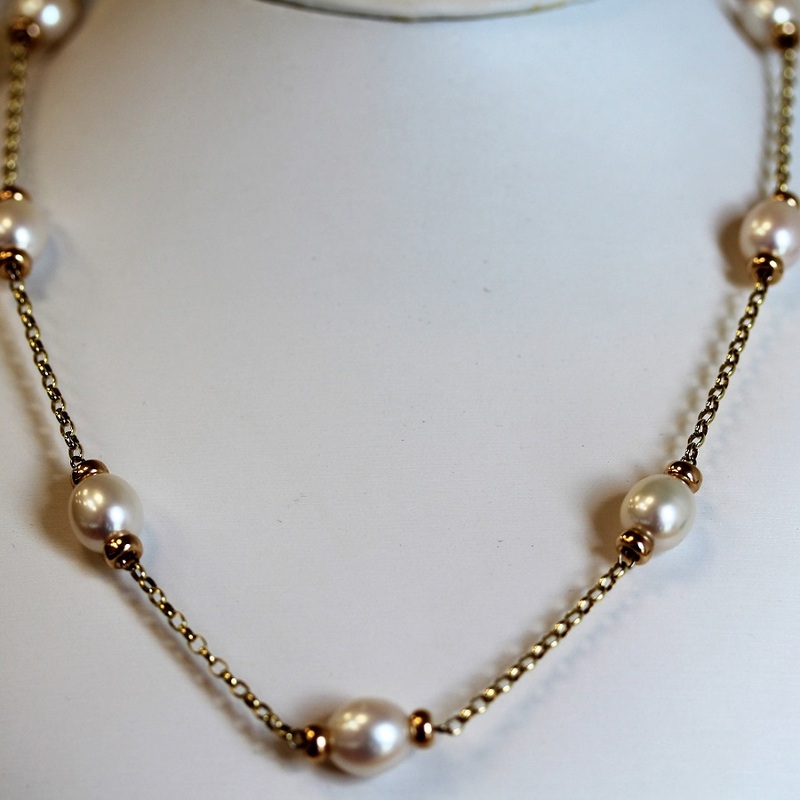 Classic ‘Mary Berry pearl necklace’ inspired by Mary Berry wearing lovely pearls on her cookery shows. 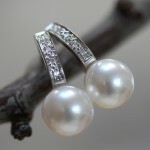 One of our very best sellers! 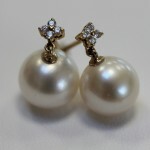 Goes perfectly with drop earrings or with pearl studs. 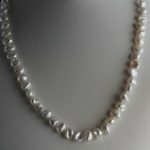 Our original Mary Berry pearl necklace is made of large rice shaped pearls. The necklace is made by hand and to order in our workshop. 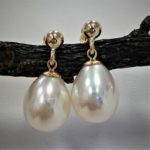 We source our pearls personally on an annual trip to China and Hong Kong where many of the world’s loveliest pearls are grown. 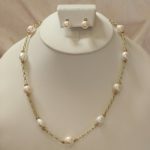 The 9.5 – 10.5mm cultured freshwater pearls in this classic necklace are stationed on 9ct gold oval Belcher chain with 9ct gold roundells and fastened with 9ct gold carabiner clasp. There are other ‘Mary Berry’ inspired necklaces and bracelets in our Mary Berry Collection. We can make necklaces to your own design, contact us with your ideas or for inspiration! 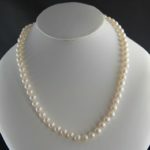 We would normally make this pearl necklace to a standard 18” length but as they are made to order, we are also able to offer longer lengths with more pearl stations. 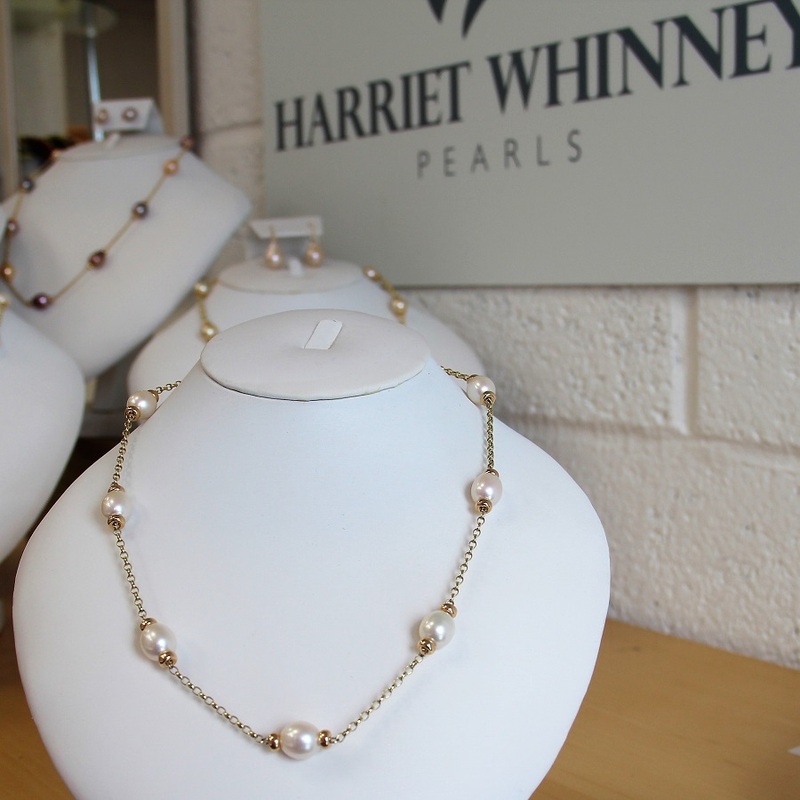 We are also able to offer this necklace using round, irregular or coin cultured freshwater pearls, please contact us for further details and a quote. The 18” necklace has 7 pearl stations, the 20”and 22” necklaces have 9 pearl stations while the 26” necklace has 11 pearl stations.